With its modern, stylish design the Rexel Promax V65WS Cross-Cut Shredder will shred up to 5 sheets of 80gsm paper at a time into small confetti cut pieces. Shred size is 4 x 34mm, giving a P-4 security rating, great for highly confidential document shredding. The shredder has a 23 litre bin capacity with a unique compaction technology - this means it can hold up to 220 shredded sheets, so you shouldn’t need to change the bin too frequently. The shredder will also cut out when the bin is full, so you know it needs to be emptied. 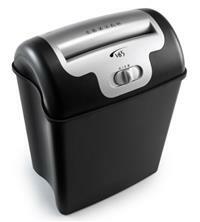 In addition to paper, the Rexel V65WS will shred staples, paperclips and credit cards, a great time saver. It also benefits from a very low noise output of less than 60dBA, meaning less distraction in the home or office! Other features of the shredder include: finger safe safety feature; overheat protection (the thermostat detects when the shredder overheats and automatically goes into cool down mode); 220mm paper entry width; and a reverse option to help clear any paper jams. Warranty period on the Rexel Promax V65WS Cross-Cut Shredder is 2 years.